Blended families are not really blended families, they are reconstituted, which is absurd, true, and sounds like orange juice. You're highly cognizant, as you stir and stir (either contemplatively or in a frenzy, and I do both) that you are trying to make something good and healthy, but also in some ways pretend it's from scratch. Most important, you're just trying not lose any taste of freshness which can still be found in it. Yes, it's an issue of freshness, and it doesn't even take any Buddhist sense of that word to feel it. But this morning isn't about orange juice, it's about coffee cake. Coffee cake is a clever and even scientific way (because baking is a science) to hold up streusel topping, which when I make it, is at least as deep as the cake itself. It's something I make for my family, my sangha of seven, especially when my and-children come, which they haven't in a while. Oh, there is pain there, seven layers deep. More on this, someday, but not Now. There are only a few big secrets in life, and they are not really secrets: love, dark brown sugar, and butter. And maybe they are all just parts of the same whole, buttressed by each other. One day, I will make ginormous Wonka-esque gobstoppers for you and we will talk about jaw-breaking obstacles and tension, but not today. Let us say that the plan to bring this sangha of seven together always morphs, sometimes maliciously, but always out of our control. Let us say, with screwed-up compassion and courage, that former spouses give us many, many, many opportunities to practice with the dharma. It seems absurd, but we have gotten a hotel room, even though we won't be staying together, just to make sure we all have a place to change. But oh, the room has a kitchen. With an oven door to be opened. A "light(ness)" goes on. I will just say that I am grateful that I took the time with it, to see: the clinging of my mind, like the the darkest brown sugar to the hottest pan. So, even though I have 14 individual shoes and tangles of bobby pins and flowers and tuxes and sashes and preferred kinds of deodorant and toothpaste to pack, I decided to bake the same coffee cake I would bake if the kids were coming up here. Because it occurred to me that it's really important that love is portable. That they see that we can love them anywhere--even in dreadfully hectic, materialistic Northern Virginia (it feels right to say this, I grew up there and away from that life). They need to know and see that the magic of our time together is not confined to Up Here, in our little world, to our happy little farm-kitchen bubble that always breaks loudly the second their time here is over. This bubble, I realize, is like a blister. It's only the body's way of dealing with pain, with assault. It is trying to make space where there is horrible friction. It's all so very hard, this reconstitution business!--and you have to think creatively. Mostly, you have think: How can we make space? For everyone, for love? Trust me, I've been trying very hard to make space in my heart for it all. Maybe too hard. If you try too hard, you lose the freshness. And the freshness is where the essence is. Meditation and my morning routine can also sometimes be something I cling to. Even cooking, in general. This is an interesting point in my own chain that Ram Dass is talking about. Because food is a big set of links. Food for comfort, food for false refuge, food for non-thought--food to numb. 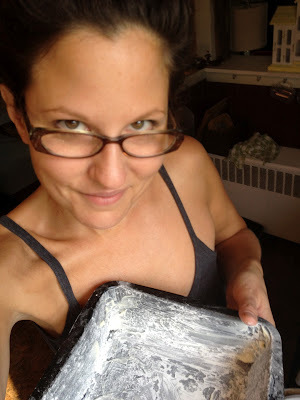 However, when I cook like this--like this coffee cake--with pure intentions, contemplatively, it is transformative. It is not addictive. It brings me back Home. Sometimes, I only get a taste--but it's there to return to. I remember. Home again, I can greet the day, my heart unarmored (no one ever says, Gee, I think I'll work on a defended heart today, by the way). This is the opposite of putting on one's face to go out in to the world. This is is putting IN one's heart. And baby, Eating at Home is where the heart is. So, now there's a coffee cake to take with us to our hotel room, and a cantaloupe. Because that is how I bring home with me. With dark brown sugar and butter. And love. Only love can bring us back Home. It's still worth buttering and flouring a disposable pan, people; that has nothing to do with mess, and it has nothing to do with cleaning up. Like childbirth, like graduate school, like laying a tile floor or digging a garden bed, no one tells you how hard it will be, how messy and how good. It's worth the real butter and the knocking the pan around with the flour because it makes The Baked Good slide out more easily. The heart wafts open with the smell of cinnamon. I don't even like sweets, by the way. I don't even bake. But I've learned because that is what I have to give, that needs to be given. The color of this wedding is yellow and black. I find that fascinating. The sun, paired with the shadow side. Oh no, how will I ever top that? Oh Baba, Someday Now I'm going to make you a Babka recipe full of my love. No videos, no song, maybe next time. Oh wait, of course: Here Comes the Sun. But you already know how that one goes. Beautiful as always My Love. Streusel (and a knowing grin) elevates all. No Sherpa required.